Beautifully engraved SCARCE certificate from the Olson Aircraft Corporation issued in 1965. This historic document was printed by the Security - Columbian Banknote Company and has an ornate border around it with a vignette of a plane. This item has the printed signatures of the Company’s President and Treasurer and is over 37 years old. This is the first time we have seen this certificate. 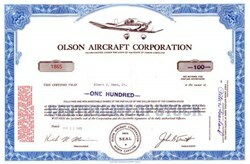 The Olson Aircraft Corporporation was operated out of Wilmington, North Carolina. They were incorporated in 1964 and was place into receivership in February 1967. The made the Olson Ambassador private small plane in 1965 that flew 3-to 4 people on a 100hp Continental O-200A engine. The plane cost around $9,000 including avionics.